Django Documentation : The best place to learn Django web development is it’s official documentation. Django official documentation is the most up to date source for learning and using Django framework. Where other Django books are now outdated , Documentation is the only place where you can find Django tutorial about latest version, as well as older versions too. Learning Django Web Development : Want to learn Django from scratch? This book from packt publication is for those folks who are going to start learning Django framework. This book will be released in July this year . So you have to wait for this. Beginning Django e-commerce : This book is step to step guide for developing an e-commerce site in Django. The book covers all the concepts that an e-commerce website uses in real life. This book gives you practical walk through on creating full featured Django e-commerce site covering SEO, Product catalog, Image manipulation, Checkout modules, website deployment and hosting on server and many more other useful concepts. Django version is 1.1 which is outdated now but still you can find this book helpful. Two Scoops of Django Best Practices for Django 1.8 (1.5, 1.6) : This book is available for many Django versions like Django 1.5, Django 1.6 and Django 1.8. This book is about how to program in Django. This book gives you through understanding on the best way to write codes in Django. It covers all the areas of modern real life Django development and prepare you to dive in the real coding style in Django world. High Performance Django : This book is for intermediate to advanced Python Django developers. This books talks about building Django web applications, deployment and post deployment strategies. It gives you info on topics like which database to use, which server to use, caching, indexing, website scalibility and maintenance and many more stuffs. Pro Django : This book is aimed for professional web application developers. Pro Django book covers all the high level concepts of Django web framework, Although they have written the book in such style that a beginner would not find any problem in understanding. But it’s good idea to take some basic understanding of Django framework before reading this book. Django Design Patterns and Best Practices : This book is not for complete python and Django beginners. You need to be familiar with Python and know basics of building an app with Django before starting this book. If you want to learn how best to utilize commonly found patterns and learn best practices in developing applications with Django, this is the book for you. Although written for Python 3, the majority of the code in this book works in Python 2 or can be easily translated. All these books are great resource for learning Django. Official documentation is the best way to learn but other books gives you much more understanding and also they give you knowledge on how to code in real world Django based web applications. 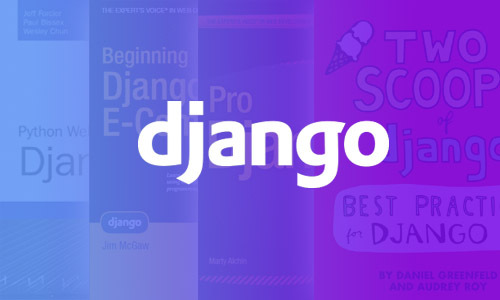 There are many more Django books which are going to be published this year. I have not included them in this list because forecasting about a tech book is not easy and it’s not a good practice. Here we try to give information about books which our team has read. We’ll update the list with these new book as soon as we get them.